The last post (box) – has Royal Mail conceded defeat to Amazon? No matter where you are in Britain it seems you are never far from a post box. From isolated hamlets to busy city centres, it’s more likely than not there is one of Royal Mail’s cylindrical red pillar boxes just around the corner from where you live. Most of us probably speed past numerous post boxes during the course of a working day. Yet we don’t stop and admire what can only be described as an iconic British symbol. And why would we? In a world dominated by electronic communication, writing letters is becoming less and less common. The logic goes that if we don’t write letters, then we don’t need to post them either. 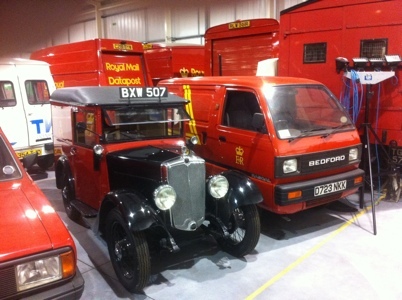 When Royal Mail announced its annual results last November it said that letter mail had declined by 25% since it peaked in 2005. This graph from the British Postal Museum & Archive illustrates the decline that’s been taking place since around the turn of the new millennium. One of the biggest casualties of this behavioural shift towards electronic communications has however been post offices. While other factors have contributed to the decline, we can say that over the last 30 years the total number of post offices has halved. Emotions can run high when the Royal Mail announces proposals to close them, especially when they are in rural areas. For older people in particular, a visit to the local post office can sometimes be the only form of human interaction they get during the day. Unfortunately given that more and more services can now be completed online the future for post offices as stand-alone entities is bleak. The best hope for preserving services is for them to be moved into other outlets such as convenience stores and pubs, creating so-called community ‘hubs’. But what about the future of pillar boxes? As the trend for online communications grows surely we’ll get to the stage where Royal Mail employees arrive at their pillar boxes and find not a single piece of mail. By that stage it just won’t be cost effective to include many stops on their rounds and it’s inevitable that there will be calls to cut them. We talk of the pillar box, but in reality there have been many variations. The first, sited in the Channel Islands in 1852, was green (and was introduced to the mainland the following year). And it was only around 20 years later that they became standardised. 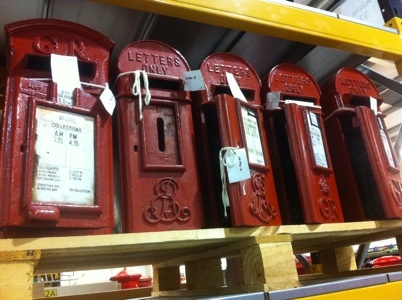 This weekend the store of the British Postal Museum & Archive opened its doors to the public. In the middle of the giant warehouse in Essex, and next to an array of Royal Mail vehicles, there is what the curators have dubbed ‘pillar box alley’. 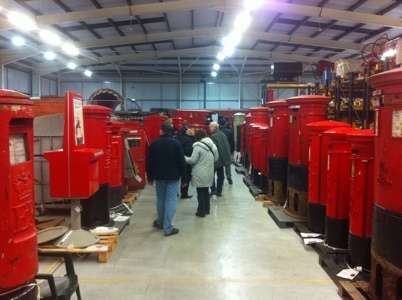 It’s here than you find 160 years of pillar box history. Seeing the original is pretty impressive and is it good to see the first, standardised red one from 1879. But it was also equally fascinating to find out about the failed experiments – like when the Royal Mail thought they’d play at removing the Queen’s head from boxes (and stamps) and when they thought it would be more efficient to move away from the cylindrical design (the way it was finished meant it wasn’t that weather proof). The Penny Black transformed the post office in the 19th century in that it opened sending a piece of mail up to the masses – it cost just a penny per item. Previously this form of communications was out of the reach of many. But I think the post box is just as important in this story. People needed somewhere to post their letters after all. Yet as I walked down ‘pillar box alley’ this weekend, I wondered how many more new designs there would be from the Royal Mail. Surely we be must be at (or nearly at) the end of the line of these red iconic fixtures? For me it’s important that we retain this heritage, meaning that the museum store is so important. But at the same time we must look to the future of post boxes. People will be sending and receiving items for many years to come. As orders on websites like Amazon (currently the Royal Mail’s biggest customer) increase, so the number of packages that need to be distributed across Britain will increase. And in a bid to make this process more convenient for customers, the company is introducing ‘Amazon lockers’ in supermarkets and other convenient public places where orders can be picked up through entering a code. With more people also selling their stuff online through eBay and other websites, it’s easy to see the trend could be two-way. Why stand in a long line at a post office when you can just drop your package off in a convenience store that’s open late into the evening? The trouble for Royal Mail is that they seem to be happy to let the Amazons of this world dominate in what I believe will be the post boxes of the future. And if everything starts to be delivered to these boxes, rather than through letter boxes, in the end the Royal Mail will be even worse off. 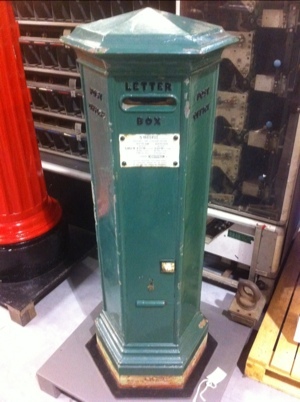 If the Royal Mail doesn’t do something to enter this market (for example through putting their own boxes in supermarkets and the like) soon then the next wave of post boxes will be in an Amazon museum, rather than the British Postal Museum & Archive’s store in Essex. Taking packages to so called ‘convenience’ stores just isn’t very convenient for me. Alright we’re not in a big city, but I have to drive 5-10 miles to get to a drop-off point for parcels, whereas we are lucky enough to have 3 post offices and multiple postboxes within a 5 mile radius.